Read this page carefully to understand the costs are associated with your study abroad program. This is a non-refundable fee billed to all students who submit an outgoing study abroad application, regardless of the sponsoring unit. The revenue from this fee is used to offset application software costs and services associated with the use and maintenance of that software. Once you have completed all application components, the “Submit Application” button will mark your application as complete, and ready to review. The fee is initiated by clicking "Submit Application" and answering “OK” to a pop-up box in your My Study Abroad account. The pop-up box may appear differently in the various web browsers but the wording is the same. The fee will be charged to your student account within a month of submitting the application. Each program will have a term-specific budget. Each program’s brochure page should include links to unofficial budget sheets. These budgets are estimates and intended for planning purposes only. Your Education Abroad Coordinator will upload official budgets into your individual My Study Abroad account following your acceptance to the program and prior to the commitment deadline. We try very hard to minimize increases from term to term but you may observe cost increases that are set by our partners or by your host institution. Important note: The above image is an example. Official program budgets will vary. Instructional Fees. Host Institution tuition and/or instructional costs and required fees. These items are considered qualified education expenses and will appear on your annual 1098-T.
Housing. If the program cost includes housing, an amount will appear in this section. Any meal plans will be included in this total. Other local fees. This fee usually includes one or more of the following: orientation costs, excursions, field trips, on-site transportation, residency fees, visa fees and other required provider or host institution fees. IAGE Admin Fee. This fee is required of all IAGE students and covers the cost of our operations. Orientation/Incoming Fee. This fee is required of all IAGE students and covers the cost of orientations for both incoming and outgoing study abroad students on IAGE-sponsored programs. Returnee Programming Fee. This fee is required of all IAGE students and allows us to provide programming to students after they return. It also helps to fund collaborations we have with units that connect returnees and international students. Support from the Office of the Dean of Students, Counseling Center, Office of Minority Student Affairs (OMSA) , Women's Resources Center (WRC), and more. Learn more about Identity and Inclusion resources. Paying Range IV Tuition is required by the university. We use base rates for all budgets and the amount billed by Illinois varies depending on the cost of your first year at Illinois and your home college. General Fee. A required Illinois fee that supports certain fixed costs. All students pay this fee, even off-campus students. Student Health Insurance Fee. Student wellness insurance is required of all Illinois students, but sometimes you can opt out of the coverage in the first 3 weeks of class. Otherwise, no refunds will be given. International Safety and Security Fee. This fee covers the cost of international health and evacuation insurances as well as services provided by International Safety and Security. 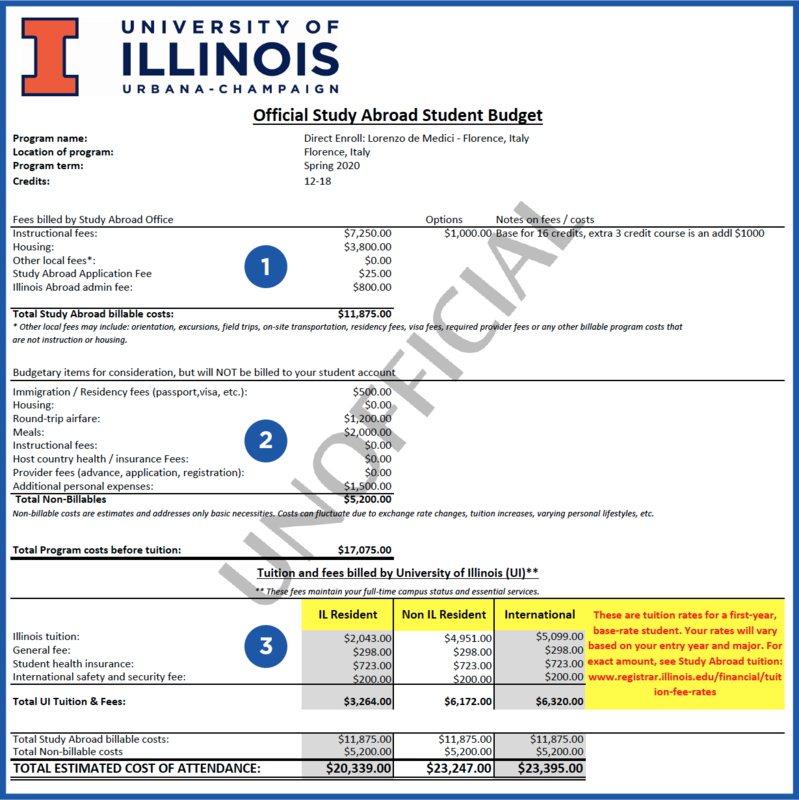 This is fee is required of all Illinois students, faculty, and staff going abroad. Items in this section are estimates, they address basic necessities and assumes minimal social expenses. Costs can vary as a result of exchange rate fluctuation, visa types, airfare pricing and how much you choose to spend on food and other personal expenses. This section is here to help you plan for the total cost of the program. Important note: If there are dollar amounts in Housing, Instructional fees or provider fees, you will have to pay those amounts directly to a vendor, program provider, or host institution. We will not be able to pay this on your behalf. This is especially important to students relying on financial aid. For example, a vendor may require a housing deposit in October but you will not get your financial aid payout until January. Keep this in mind when selecting a program.